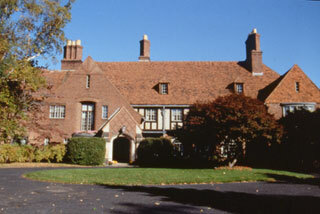 A 32-room Tudor mansion on the National Historic Register, 20 minutes from Hartford & Litchfield. Walking distance to Carousel Museum & Clock Museum. We add those little touches our guests tell us mean so much to them... feathered beds, pillow chocolates, fresh fruits, homemade cookies and assorted teas. 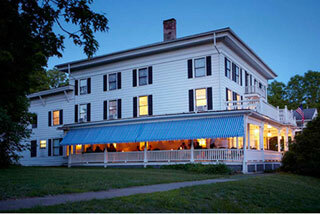 We'll even be glad to serve you our piping hot, plentiful breakfast on the Grand Patio off the Foyer. Visit with us for pleasure or on business. 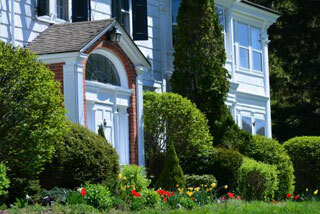 We will treat you to warm, attentive bed-and-breakfast hospitality set in the splendor and style of a bygone era. On the upper level of our Main House, we have two lovely premium rooms and two spacious suites, almost all of them with wood-burning fireplaces. Our Carriage House, with its simpler accommodations, sits behind the Main House and offers 12 deluxe rooms, configured with queen beds or twin beds. We also offer family suites consisting of two rooms and one bathroom. All of our rooms are equipped with air conditioners, TVs, and complimentary Wi-Fi. Next to our Carriage House sits a one room deluxe cottage with a jacuzzi tub, separate shower, and wood-burning fireplace. Author of the widely acclaimed Affair with a House, Bunny Williams has been designing and decorating for clients around the world since the mid-1960s. As the New York Times has written, her designs always account for “a place to put your feet up and your drink down. It’s a lifestyle that should look and feel old-fashioned — yet manages not to.” We are proud to have secured the talents of Ms. Williams to create your room here at the Falls Village Inn – a suite designed to be a comfortable, sophisticated background for a rich, fulfilling life.